Storms beginning to fire near Holyoke, CO. Nice base and updraft on the left. Mothership base of storm in the foreground and another storm base in the background. Really nice LP storm near Lamar, NE. Storm kept popping cg's and had shear funnels the whole time we sat watching. 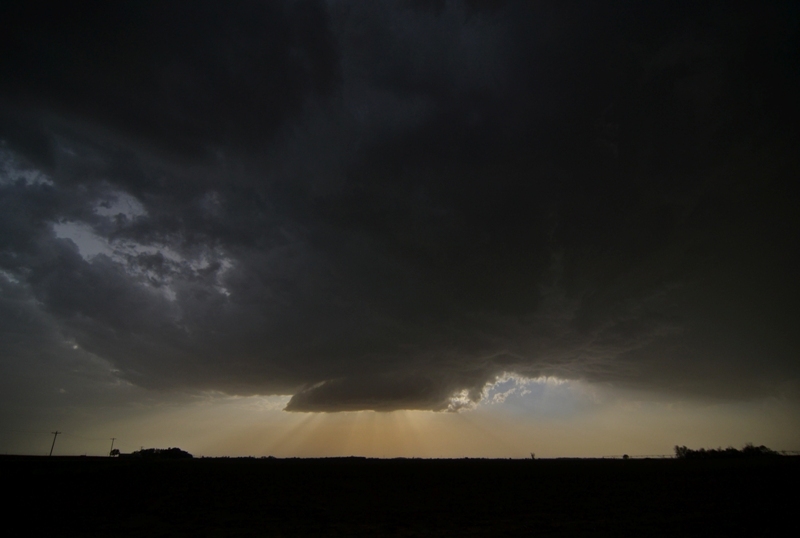 View of the base of the left storm as it approached us near Lamar, NE. Beautiful, backlit LP! Lowering on the storm near Grant, NE. One of my favorite shots I have ever taken. 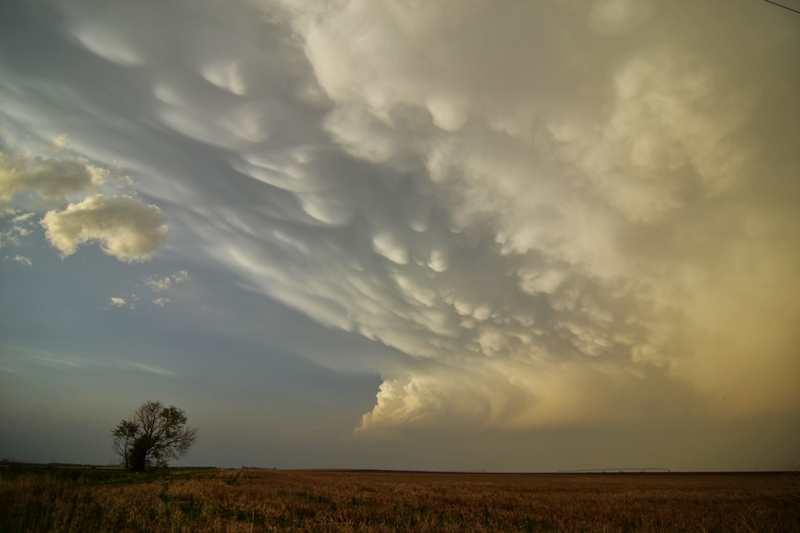 Incredible mammatus and storm near Grant, NE near sunset. 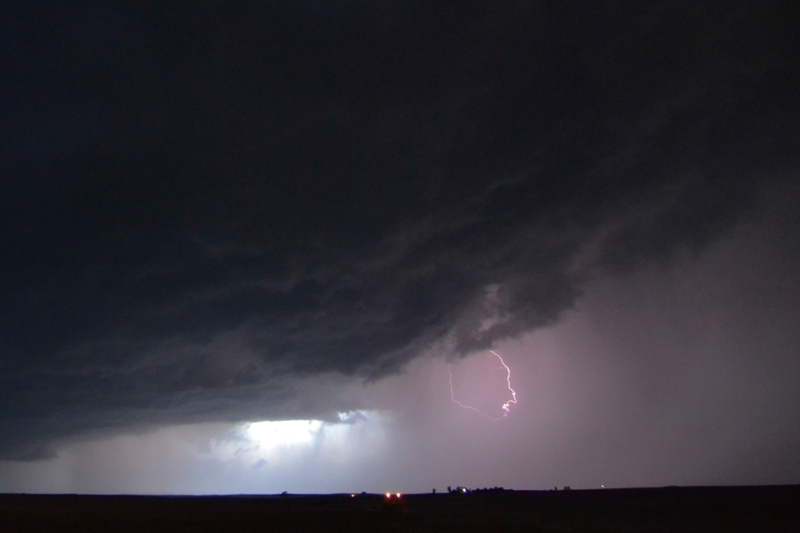 Lightning illuminating the storm near Elsie, NE. 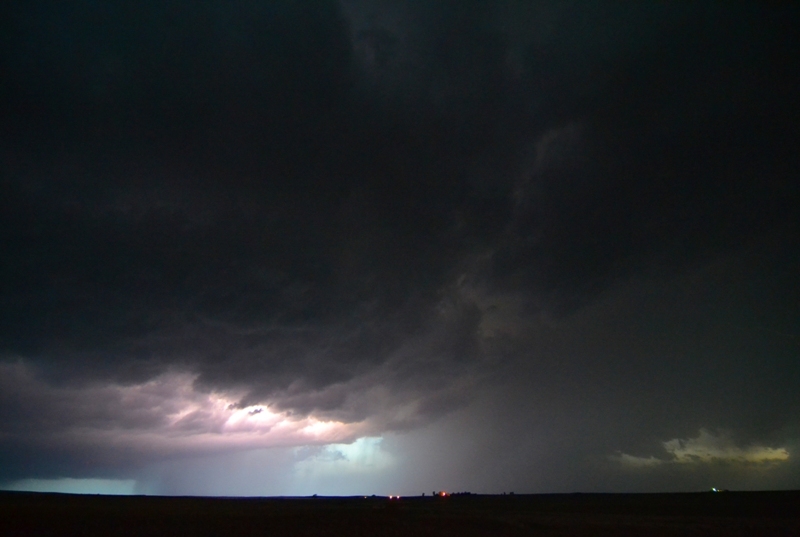 Another shot of the storm being lit up by lightning near Elsie, NE. Another bolt from the right and a nice view of the storm structure. Starting the day off in Amarillo, Texas, we had 3 distinct chase targets for the day, one in northeast Colorado/southwest Nebraska, a “Campo”-style play near Lamar, Colorado, and a lesser play up in the Nebraska Panhandle near Sydney. As we headed north, we were faced with a puzzle as the models were in complete disagreement regarding where the best storms were going to be: While most pointed toward the area between Wray, CO, and Imperial, NE, the HRRR broke out a huge supercell down near Lamar and had virtually nothing in northeast Colorado. We decided to hedge our bets but lean towards the north because the conditions all pointed that way, and as we lunched in Burlington, CO the winds there were veered and the dew points dropping rapidly as the dry line approached, so we decided to head north to Wray. The transit through southeastern Colorado was amazing: I’ve never seen it so dry down there and as a result, it seemed that there was blowing dirt from horizon to horizon throughout the whole region and Sheridan Lake was completely dried up, with the lakebed adding to the blowing dirt. In Wray, we were posed with the same problem as earlier: Storms were underway and looking decent to our south, but up north where our target area was, the towers that were forming kept withering and dying. Still, our attention was drawn by the Holyoke, CO surface observation that suggested dewpoints in the low 60’s streaming into the area. Finally after a long wait, two updrafts finally managed to get established and we raced up north in between the two of them. Once we got to Holyoke we were right in between the two cells, but they weren’t looking great, with the left split being a tiny little LP Supercell spinning away but very high based, while the right split kept pulsing up and down. Meanwhile, there were solid cells to the north and south that alternately looked good then lousy from scan to scan on radar. We decided to head east on Route 6 as that would allow us to keep contact with the western cell but also be in position to move to any of the others near us, as one thing that did work to our favor was that all of the storms were moving very slowly. Crossing into Nebraska, we stopped near Lamar (Nebraska, not Colorado) and observed the Western storm as it seemed to be getting better organized. This was a continuous theme for the next 6 hours: every time we tried to leave the storm, it showed us just a little something that made us stick with it, despite different cells around us pulsing up and down and enticing us towards them. Near Lamar the storm showed a nice rain-free updraft and was popping cloud to ground lightning bolts continuously. We also saw several shear funnels on the storm, one of which persisted for at least 3 or 4 minutes before it fizzled out. As the storm didn’t appear to be intensifying while others around it did, we headed east, then north, bypassing Imperial. As we headed into Grant we got pounded by golfball hail from the front flank core of our storm, then as we popped out north of the core near Grant we were gifted with a tremendous mammatus display on the backshear of the anvil from the cell to our north, a cell which was showing rotation on radar. 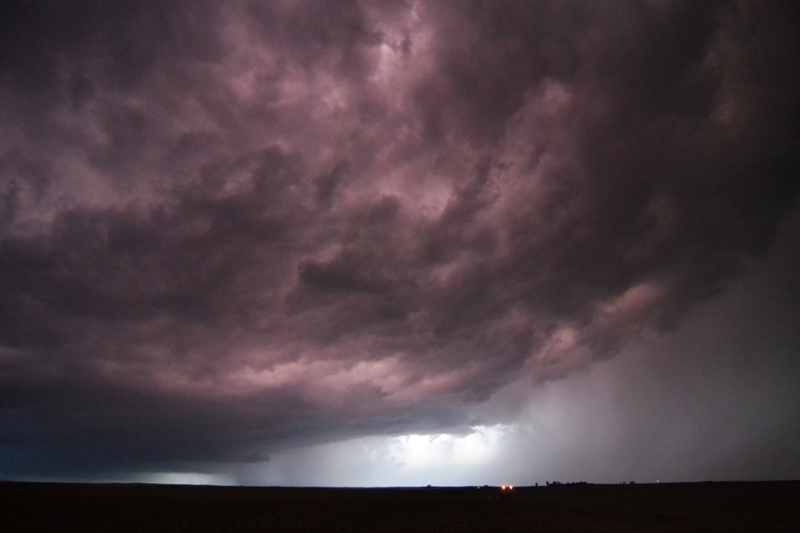 But again, as we drove away from it our cell pulsed back up and showed rotation of its own. At this point it had the classic “backwards C” looking updraft and clear rotation. After numerous brief stops to watch our storm, we headed east as it started to get dark and, as the low-level jet kicked up the storm really took off. 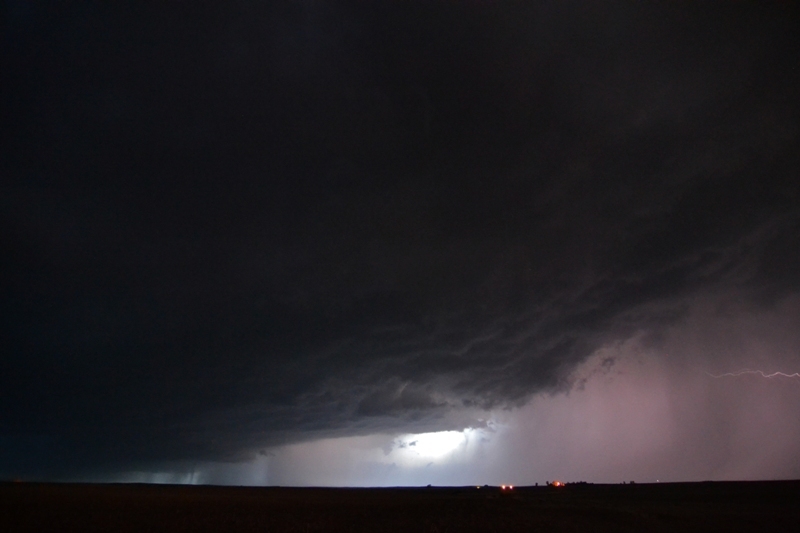 Just at dusk the storm gave us a fantastic lightning show near Elsie, then as we continued east the storm was tornado warned and showed strong rotation on radar. We noted a lowering under the mesocyclone in the distance, but could never see anything touch down. We proceeded south of Wallace to get out of the rain and parked and watched as the area of rotation came right to us. The inflow winds were pouring into the storm past us, and as they blew through the wires overhead it created a spooky howling sound that added to the atmosphere. After about 20 minutes the hook echo was almost right on top of us and we had to run to the southeast to get out of the way. We found a place to watch it pass and observed a large blocky wall cloud through the rain on the back side of the hook as it passed by, but again no tornado. Finally, the rotating area was well past us and there were no roads that would allow us to keep up, so we headed north behind the rear flank of the storm with a great cloud to cloud lightning display just to our east and all kinds of tree debris from hail on the road. We thought we’d see some big hailstones as we headed through the tree debris and hail fog, but never spotted any. Not long after that the storm collided with a left-mover to its south and collapsed so we called it a night and made the easy 40 mile trip to our hotel in North Platte, though that did mean driving through the northern part of the collapsing core, which was a bit of a challenge.